Tension, supernatural beings, and dramatic sound effects. These are the things that make for an excellent made-for-TV movie. Thankfully, The Norliss Tape has plenty of all three. 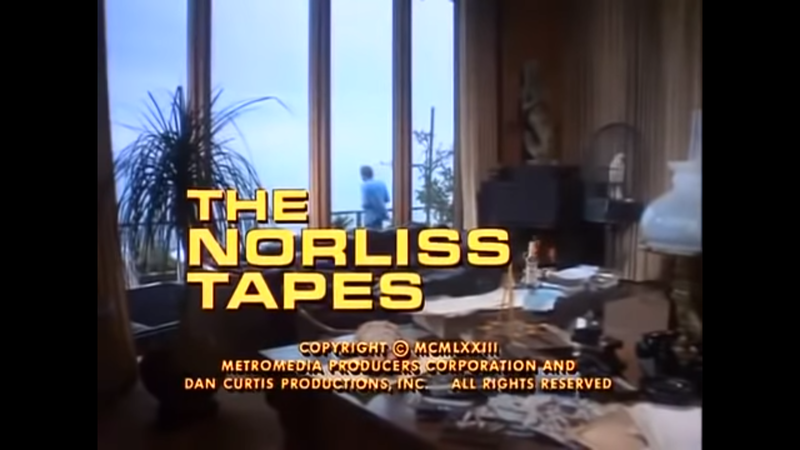 The Norliss Tapes was directed by Dan Curtis, known for Burnt Offerings, made-for-TV movies like Trilogy of Terror and creating the soap opera Dark Shadows. And while I love Trilogy of Terror, this earlier work has much more of a Barnabas Collins vibe. David Norliss is a semi-successful writer, supposedly working on his newest book for the last year. He sold to his publishers a book debunking the superstitions and gimmicks of the occult. But when he calls his publisher nearly a year into his work, he admits that he has barely written a word. His publisher, Sanford Evans, agrees to meet with Norliss, but the writer never shows. Eventually, it becomes apparent that David has vanished. Evans goes to David’s home to investigate. He doesn’t find David, but he does find a selection of tapes in which he decides to listen to the first one. In chapter one, David begins investigating a supernatural occurrence. He meets with two sisters, one of whom which is newly widowed. Ellen Cort explains that she was awoken one night by her dog’s barking. The dog led her to her deceased husband’s sculpting studio. She eventually comes face-to-face with a man who kills her dog. She shoots him but he doesn’t seem truly harmed. She then admits that the man who attacked her was none other than James, her dead husband. She also tells David that James was buried wearing a scarab ring that he acquired from a Mademoiselle Jeckiel. That night, a girl is attacked by a man who was hiding in her car. When her body is found, she’s grey and shriveled. The coroner tells the police that the girl was completely drained of blood. After the attack, Ellen takes David to the mausoleum where they look at James’s body, which is still in the coffin. Ellen takes that as a sign that she might be going crazy. Though they also see that he’s still wearing the ring that he was buried with. David then moves on his investigation to an art dealer named Langdon, who had a particular interesting in buying the scarab ring after James’s death. At the gallery, the gentleman explains that he sold most of James’s work. When David asks Langdon about the ring, he becomes indifferent, explaining that his interest in buying the ring was only because it was unique. David lets slip to Langdon that James was buried with the ring. Langdon then goes to the mausoleum to grab the ring. But James wakes up to claim his next victim. David eventually goes straight to the mystical source, Mademoiselle Jeckiel. She’s even more evasive than Langdon was. She refuses to answer most of David’s questions. But she does warn him to stay away from Ellen’s house. When David and Ellen return to James’s studio, the find a new sculpture. David notices that the clay is still wet, as though it had been worked on recently. But how James’s body was able to travel from the crypt to the studio was still a mystery. But David gets his answer when he studies the blueprints of the house and discovers a network of tunnels underneath. He also learns, after studying the new sculpture’s clay, that the clay is made up of blood. Mademoiselle Jeckiel seeks out Ellen later and warns her about James. She tells Ellen that before his death, he made a pact with a deity to create a sculpture in exchange for immortality. James is only a few more victims away from competing his work. Jeckiel and Ellen go to James’s grave together to remove the scarab ring – the only way to end him. But James wakes up and kills Jeckiel. Norliss finds Ellen in the tunnels, and the two escape to the studio as the sculpture comes to life. But Norliss sets the studio on fire, sending both the deity and James back to where they came from. As the tape ends, Norliss’s fate is still unknown. But Evans ejects the tape and prepares to listen to chapter two. This movie was originally intended to be TV pilot, but the show was never picked up. In some ways, it’s pretty interesting that way. It leaves the ending fairly open ended. I like when a mystery lingers, but still manages to give some answers. The Norliss Tapes is very atmospheric, if a bit slow at times. It’s certainly no Trilogy of Terror. But it’s worth seeing just for the aesthetic alone. There were a few things that were slightly confusing about the movie. Like, if David Norliss was such a known skeptic of the occult (an “investigator”), then why go to him first when you have a supernatural experience? I’d skip the skeptic and go straight to the priests and mediums. This also weirdly reminded me a lot of Scream, Pretty Peggy, which I had first watched last year. What’s with the year 1973 and demonic sculptures? But this was certainly another solid entry in the realm of made-for-TV movies.